Drum sanders manufactured by Powermatic are some of the most powerful and capable sanders on the market. Their models all have very interesting features that are useful for any serious woodworker. All the models have different strongpoints that make them the best in their range, which is what this review will focus on. 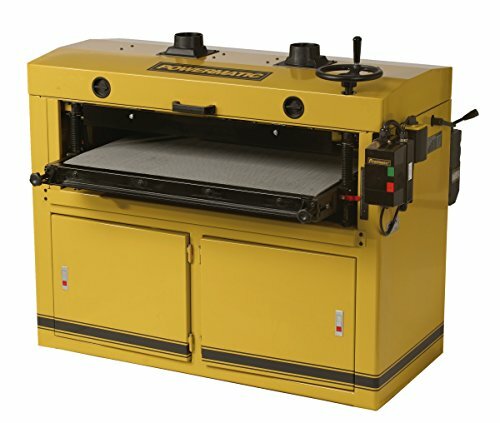 This is one of the more cost effective sanders that Powermatic offers. It has nice modern features which will make your sanding work a lot easier. This is a handy feature that allows you to view the speed of the drum and the power. It also helps in calculating the depth for attaining the perfect sanding results depending on the nature of the piece that you’re working on. At 1-3/4 hp, you can be sure that this sander will handle any kind of sanding job no matter how hard or rough the piece you are working on is. It is designed to give you a smooth finish on any piece thanks to the 5 inch diameter and 22 inches long drum that this machine packs. The feed logic system is useful since it prevents you from overloading the machine hence destroying it. It also has an auto-pilot system that ensures maximum speed is maintained so as to prevent overloading which can be as a result of a poor performing motor. This one boasts as one of the best drum sanders in the market for commercial use. 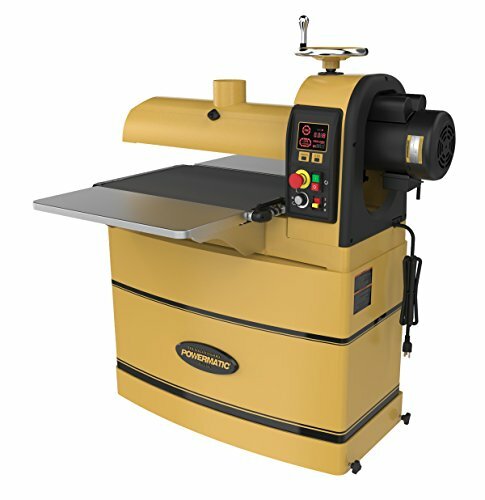 This dual drum sander has quality features that are meant to ensure you achieve nothing but the best results, the only downside being the hefty price tag. If you are looking for a powerful motor that nothing can get past, this is it: this model comes with a 7.5 horsepowers motor. The motor runs the two drums which both have a rubber covering to ensure you get a smooth finish on your pieces. It also has a 2-speed forward and back gearbox which allows to sand either eight or twelve feet of surface per minute, saving a lot of time during intensive production work. It is very easy to put together and to start using this machine. It has a great dust collection system which not only aids in keeping the work surface clean but also safe. The covered cabinets ensure that you are completely protected when using it which reduces incidences of accidents and any other kinds of mishaps that may happen. This sander has a very large cast table which not only provides sufficient working space for you, but also the support you need to work on any kind of piece. It has a total of four jackscrews and a chain drive timing which ensures that it is nice and level when you’re using it. Not only do these provide enough space for you to store any other tools that you may use when sanding, but they also ensure that you do not get any vibrations when sanding. This is meant to give you a clean and smooth finish on your pieces that would otherwise be difficult with the vibrations. 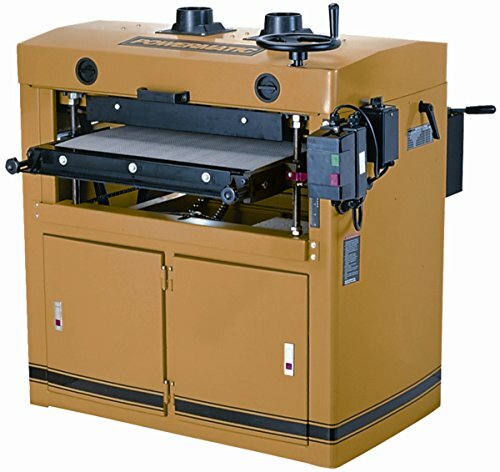 This is another excellent yet slightly cheaper dual drum sander that is a favorite among professional woodworkers. It has most of the features of the 1791320 model while being more reasonably priced, which explains why it is such a popular machine. These provide sufficient storage space for all your tools and accessories while protecting you from any harm when using the sander. It also provides adequate support needed to keep the machine stable during use. The sander boasts a 5hp motor that drives the twin V-belts. This amount of power comes useful when sanding large surfaces at good speed and with good accuracy. It is not easy finding a sander with a heavy cast iron table that you will get with this sander – it’s similar to the bigger 1791320. It is stable and heavy enough to handle any kind of piece that you will be working on. It is adjustable to allow for you to easily work on even the most complicated pieces without breaking a sweat. This line of tools are not only a sight to behold, but they also pack the power and features to back that up. They are the perfect assistant for anyone looking for a one-stop shop for all their large surface sanding needs since they have all the necessary requirements to achieve that. The price tag on most of them is reasonable enough since they have the features to match it so this would be a worthy investment for anyone looking to make it.